If you’re taking your dog boating, swimming, kayaking or paddle boarding, you’re going to want to find a sturdy dog life jacket to keep them safe on your adventures. Choosing a life jacket for you and your dog can be a challenge. In this article, I’ll review five different canine life jackets to help you choose one that works for your dog. When you’re out on the water, you might not think your dog needs a life vest. Many dogs are strong swimmers, but they can fall into danger just as easily and accidentally as humans can. Life vests are also recommended for dogs any time they’ll be traveling over rough or deeper water. Features and construction of life jackets varies by brand and necessity, so it’s important to know what the differences are and how those differences affect the life vest’s functionality. Fabric – Neoprene is often used as a buoyant material to both aid flotation and provide comfort. Nylon is also a common material used for life vests, though it’s rougher and less durable than neoprene dog life vests. Safety features – While many life vests have similar features, the placement and functionality matters, too. For example, you don’t want the handle on the vest set too far back or else when you go to pull your dog out of the water, his nose will dip right back in! All life vests are not created equal, and there’s no “one size fits all” option here. In order to choose a safe, effective, and comfortable jacket for your dog, there are a few things you’ll need to think about first. Do you have a large dog like a Labrador Retriever or a Boxer? Is your dog a teacup Yorkie? Is your dog muscular and used to power swimming or does she spend more time with her spindly legs curled up in your favorite chair? Does your dog have a lot of body fat? Is her coat short and waterproof or long and silky? One of the first and most important steps to finding a well-fitting life jacket is measuring. This will allow you to select a size that will provide both protection and mobility for your dog. Proper measurements also ensure that the vest works properly. A too tight vest may cause your dog pain and restrict movement whereas one that’s too loose could have your dog slipping out of it. Many life jackets have sizing charts you can reference that help you choose the right size. Each of those features is important for your dog’s safety. While it’s up to you to decide what best suits your dog, there are some key factors that you might want to consider. For example, what if your dog is out on a boat at night? My dog is almost all black, so a brightly colored vest or even reflective tape is essential in the event that I have to find him in the water. Regardless of your dog’s activity level, it’s a good idea to get him a life vest. Still, there are some dogs who need them more than others. If your dog is overweight and doesn’t have a lot of stamina, you might want to look into life jackets that can accommodate his heavier stature. Age and illness can also impact a dog’s safety needs, so make sure you’re thinking of your dog’s individual requirements as you sort through your options. Other people’s experience can be a great tool. If you find a dog life vest you like, scroll down and see what people who have tried it are saying about it. That will give you a clue as to whether it’s a good fit for your dog and whether it works properly when put to the test. Here are a few doggie life vests you might consider in your search. The makers of this dog life preserver seem to have thought of everything. It has all of the features I described above. The jacket is designed specially for dogs who love the water, and the foam panels are placed in a way that allows your dog to move freely both in the water and on land. I like the design because it takes into account both safety and a dog’s natural movement. This life jacket comes in six sizes, from XXS to XL, to fit a wide range of dogs. It pays to make sure you’re getting the right size, though, so make sure you measure properly before choosing a size. Once you’ve done that, the life jacket takes care of the rest with a telescoping neck that will conform to your dog’s body and reduce slippage of the garment, and straps secure around the body. The straps adjust to fit your dog, and sheltered buckles ensure they stay in place while your dog has his fun. This life vest also comes in a variety of bright colors and sports reflectors for any night swims. The handle on top of the vest makes it easy for both of you when it comes time to lift your dog out of the water. The jacket overall is durable and as a dog owner myself, that’s one of the most important things. If you’re planning on going on lots of adventures and you don’t want to be spending money replacing your dog’s life jacket every year or so, it’s a good idea to look for one you know will last. Speaking of price, this is the priciest option of the five life jackets I’ve listed here. However, in this case, you get what you pay for. This jacket has a very high approval rating and is built to last making it the top rated dog life jacket. This jacket is one of few that has flotation underneath the body as well as the sides and top. It fits dogs with challenging body types, like French Bulldogs, and helps dogs become more confident in the water. The straps hold in place well when you use the handle to pick your dog up. The vest even has an ID tag holder and a place for a light. This dog float vest is made for comfort and security. It’s made with neoprene, which makes it both soft and durable, as well as providing extra flotation for your dog. Additionally, this jacket features 50% more flotation material overall than many other dog life jackets. The jacket covers most of the length of the dog’s body and has a lifting handle about halfway down the back. The vest slips over your dog’s head and buckles using two wide straps beneath the body. Both the neck and body straps are fully adjustable to make your dog as comfortable as possible. Each available size comes with a guideline that shows which size fits which measurements on your dog, including neck circumference, chest girth, and back length. It’s available in a few colors, including camouflage, red, and yellow. Reflectors line the material to make for better visibility, and a D-ring on the back of the vest allows for attaching a leash or a light. It also has handy storage pockets and a drying loop for when your dog is done playing in the water. This life jacket provides excellent flotation, even for large dogs, though it may not be as effective for smaller breeds. It is easy to adjust and durable and for many dogs the fit allows the dog to move as naturally as if she weren’t wearing it at all. The back of the vest is long – too long for some dogs – and squared and may hang over the rear end. This may not be ideal for dogs with tapered body types, though it can work well for bulkier breeds like Pit Bulls and American Bulldogs. If you’re looking for a dog flotation vest that works for all kinds of water activities, this may be a good one to consider. It’s made with neoprene material, so it is abrasion resistant as well as soft and comfortable for your dog. It also uses neoprene foam for flotation, which ensures extra support for your dog in the water. The zipper on the top of the vest allows you to put on and remove the vest without issue, and has a protective flap to keep long-haired dogs’ fur from getting caught. Buckles and straps around the body and chest add security for your pet. There’s a handle on the back and the SOLAS (Safety of Life at Sea) reflective surface increases visibility in the water. The vest is affordable, but it comes at the cost of certain features. For example, the vest only comes in one color which, while the reflective surface is helpful, is not very bright and may not be ideal for finding your dog in the dark or from a great distance. I’d feel a little uneasy if I were to use this one for that reason. I know I’d feel a lot more comfortable if my black dog were wearing bright colors at any time of the day if I were letting him run and swim off leash. The sizing also leaves something to be desired. While it comes in sizes S through XL, the guidelines for this life jacket say it fits dogs as small as 12 pounds and as large as 120 pounds. That may be fine for my 75 pound lab mix, it’s not going to fit a Mastiff over 150 pounds. Plus, there are minimal guidelines for how to measure and choose your dog’s size. While this vest has adjustable straps to keep the vest snug on your dog, the straps can be difficult to adjust. At the same time, these straps are good for dogs sensitive to touch on their bellies. It’s easy for a dog to move around in and the breathable material keeps your dog from overheating while swimming and playing. This vest comes in 8 neon colors, including 2 vibrant camouflage options, that are all reflective. The sporty design is both stylish and effective, allowing your dog to move freely and comfortably while enjoying her time in the water or on your boat. This dog flotation device has passed the CA65 safety standard which in my opinion is reassuring when counting on something to save your pet’s life in an emergency. The jacket is designed to fit various dog sizes and comes in sizes XS to XL, and provides a handy measuring chart to show how to properly measure your dog before choosing the right fit. It makes a great puppy life jacket as well due to its flexible adjustability. With the proper size, this jacket can protect your dog from unfortunate circumstances due to its extra flotation in the chest area and on the sides. The handle is located in the center on the back of the vest, creating balance when you pick your dog up out of the water. The vest also has a D-ring that allows for convenient leash attachment. In addition to a quick release buckle, the vest comes with Velcro straps to provide even more security and make sure the vest stays on without slipping even during your dog’s most intense swim. With all of these effects, the vest can practically custom fit to your dog. This life jacket is extremely affordable, and appears to provide several excellent features to increase pet safety. The sizes can change dramatically from one to the next – some run small, others are too snug on pets who try the L and then too loose when upgraded to the XL dog life jacket- so measure carefully and ensure proper fit before putting this product into action. The life vest is suitable for many sizes and weights, ranging from 30 pound French Bulldogs to 80 pound Pit Bulls and larger. Weak swimmers gain confidence from the vest and can swim without fear. The extra straps and security don’t compromise the dog’s comfort and most swim and walk around without hesitation. It also fits dogs with varying body types, including Greyhounds. One of the unique features of this dog swimming vest is that it comes with not just one handle but two to allow you get a better grip on your dog when you need to lift her up. This creates greater balance and and comfort for the dog and you, as pressure is not centered on one point of the dog. The jacket comes in several sizes from XS to XL, and using the sizing chart can help you decide which size is best for your dog. While the life vest comes in a vibrant red, this is unfortunately the only color available. At least you’ll be able to see your dog wherever she is, right? Additionally, this particular vest does not cover as much of the dog’s body as the others I’ve listed and therefore doesn’t provide as much flotation. The flotation panels the vest does have are located only on the sides of the vest, and not underneath or at the chest. For this reason, this life jacket could be great for inexperienced swimmers who likely won’t stray too far from shore and need a little help with swimming, but may not work as well for enthusiastic water lovers. You may want to be careful, too, because this vest does not come with a D-ring for attaching a leash. 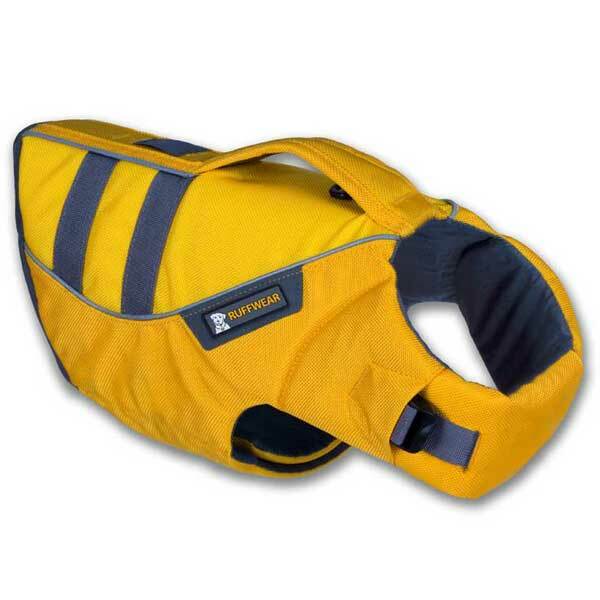 This dog life vest is also equipped with insulation to keep dogs warm in colder waters. This is an excellent feature for small dogs or dogs with minimal body fat to warm them, though it may not be ideal for long-haired dogs or dogs with lots of natural insulation. Straps around the dog’s body and around the chest buckle in place, and Velcro tabs secure over these straps to protect your dog from getting caught on unseen obstacles below the water’s surface. This life jacket is fairly affordable, but there are other options that are comparable in price and perhaps cheaper that offer better quality. What I believe to be the greatest downside is this vest’s lack of durability, which I consider to be one of the most important features following flotation and security. The double handle makes lifting the dog a small effort and the vest itself appears to be comfortable. It dries quickly, even while the dog is wearing it and is made with breathable neoprene. The adjustable straps allow for dogs in between sizes to have a comfortable and accurate fit. However, the straps tend to come loose and the vest may slip or rotate on the dog’s body, particularly around the neck area. For heavier dogs, the vest does not always hold up and they sometimes sink in the water. Finding a good life jacket for your dog can be tricky. You want to get one that fits well and is comfortable but doesn’t sacrifice safety. There are tons of pfds for dogs on the market, which is why I chose these five to show you and give you an idea of what’s out there and what features to look for. While each of these life vests is different, they’re all meant to accomplish the same thing. That’s why, after looking at each of these five options, I consider the Ruffwear K9 Float Coat Dog Life Jacket to be the winner. While it may be the most expensive option, I think it’s worth it. Each customer review had nothing but praise, whether it was for the jacket’s functionality, durability or comfort, and each one agreed it’s worth the price. I would feel safe using this life jacket for my dog above the others, and that is why I chose it as the clear winner of this group.